US Marine Corps/SSgt. Kenneth K. Trotter Jr.A Spanish air force Eurofighter Typhoon trails a US Marine Corps KC-130J to receive fuel as part of a bilateral fixed-wing air-to-air refuelling training near Morón Air Base, Spain, July 13, 2017. 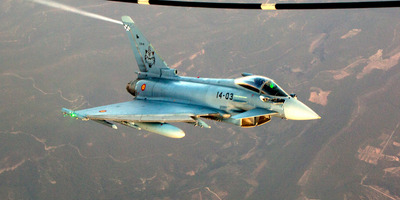 A Spanish jet on a Baltic air-policing mission accidentally fired an air-to-air missile over Estonia on Tuesday. The missile has a self-destruct mode, but it’s not known if it was activated. Estonian authorities are currently searching for the missile, and Spanish and Estonian officials are investigating the incident. A Spanish air force Eurofighter Typhoon fighter jet accidentally fired an air-to-air missile during an a routine training exercise over southeast Estonia on Tuesday afternoon, and authorities have not been able to locate the missile or what is left of it. The Spanish jet fired the missile – an advanced medium-range air-to-air missile, or AMRAAM, made by US defence firm Raytheon – a little before 4 p.m. local time over the village of Pangodi, as it returned from an exercise with another Spanish jet as well as two French Mirage 2000 jets. The exercise was carried out in an area reserved for such activity about 60 miles from the Russian border. All of the planes are based in Siauliai in northern Lithuania, and the jet that launched the missile was able to return to the base. 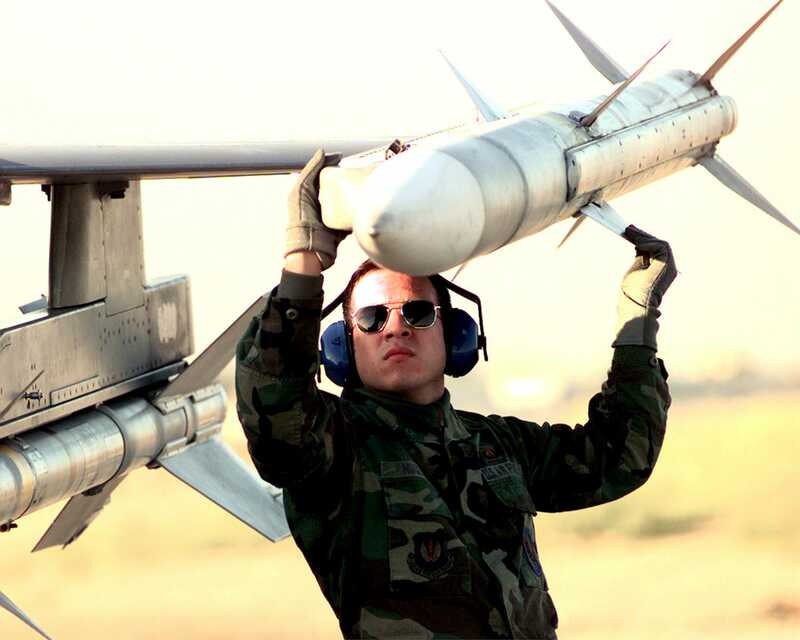 US Air ForceAn AIM-120 AMRAAM being loaded onto an F-16 fighter jet. The missile’s last location was about 25 miles north of the Estonian city of Tartu. It was reportedly fired northward, but the trajectory and its final location are not known. The 12-foot-long missile has a range of about 60 miles and carries a roughly 50-pound high-explosive warhead. The missile has a built-in self-destruct mode for such occasions, but it’s not certain that it was activated, and the weapon may have landed on the ground. The Estonian Defence Ministry has launched a search for the missile using helicopters, and emergency services in the area have asked residents who happen upon the missile or parts of it not to approach it. “I am sure that the Estonian defence forces will, in cooperation with our allies, identify all the circumstances of the case and make every effort to make sure that nothing like this happens again,” he added. Estonia’s defence minister also ordered the suspension of all aerial military exercises in the country’s air space until the incident was resolved. The Spanish Defence Ministry also opened an investigation. NATO’s Baltic air-policing missions were set up in 2004, after Estonia, Latvia, and Lithuania the alliance, to assist the new members with air defence and deter Russian aerial incursions in the area. Spanish jets have done five of the three-month air-policing tours, leading them in 2006 and 2016 and taking part in 2015 and 2017. 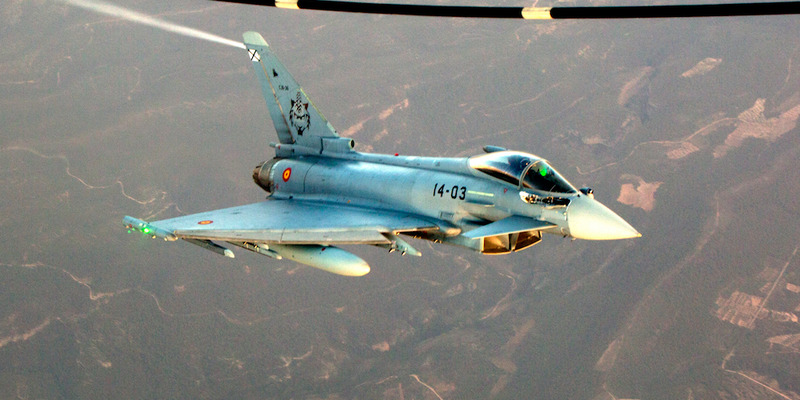 The current Spanish deployment is composed of 135 personnel and Eurofighters jets. It began on May 1 and will conclude on August 31. Jets from NATO countries deployed on air-policing missions have had regular encounters with Russian jets over the Baltics, though there were no reports of Russian aircraft in the area when the missile was fired on Tuesday.